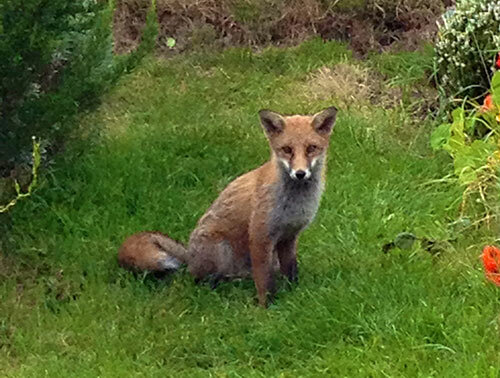 Foxes (sometimes half a dozen can be spotted at one time) are an accepted part of the Warriston scene. While they occasionally do damage to beds and seek refuge under sheds, they are fairly amicable and undemanding neighbours. * Foxes first came to live in British cities in the 1930s, a process facilitated by the building of houses with medium-sized back gardens and allotments. These provide the diverse array of food, cover during the day, and den sites (hedges, scrub, compost heap, sheds) that foxes need to survive. * There are about 260,000 adult foxes in Britain (rural and urban). * Foxes are members of the dog family. A female fox is called a vixen, a male fox is a dog or a tod, and a young fox pup, kit or cub. A group of foxes is called a skulk or a leash. * Foxes can retract their claws like cats. Foxes also have vertical pupils like a cat. * Foxes are omnivorous, i.e. they will eat anything. In cities, the largest component of their diet is scavenged items such as meat, bones, bread and bird food. They also eat wild mammals (rats and mice), birds (mainly pigeons) and invertebrates (worms, beetles, cutworms (moth larvae) and adult craneflies (daddy-long-legs). A study in Bristol showed that insects make up 10% of a fox diet and earthworms about 6%. * In the city, foxes dig holes to hide extra food. When hungry they go to these earth larders for a snack. * Mange is a common disease of foxes and has caused fox population crashes around the world, including Britain and Scandinavia. Mange spreads effectively through rural and urban populations and can appear as a light (short term effects) or heavy (leading to death) infection. * Foxes can live to about 15 years in captivity but usually about 2 years in the wild.